Unlike many products that claim to be the next fountain of youth but quickly lose their celebrity status, resveratrol, a phytochemical, may be held in high esteem for quite a while. Found in grape skins, red wine, certain berries, nuts, peanuts, and dietary supplements, resveratrol is highly touted to promote vitality, wellness, and longevity and combat chronic disease. There’s considerable hype and intriguing research behind resveratrol. This continuing education activity will evaluate the current evidence surrounding this phytochemical, its mechanism of action, and its protective effects against a host of chronic illnesses. In the early 1990s, research emerged to support anecdotal evidence about the health benefits of red wine, specifically its serum lipid-lowering effect. Much of this anecdotal evidence, largely known as the French Paradox, came as a result of observing the French, who have low coronary heart disease (CHD) death rates despite a high intake of saturated fat.1 The French diet derives 35% to 40% of its calories from fat, including 16% from saturated fat.1,2 The US diet comprises roughly the same amount of fat,3 yet the French have considerably lower mortality rates from CHD. Resveratrol’s chemical structure gives it the ability to activate sirtuins, a family of enzymes that play a critical role in a wide variety of processes in the body, including gene expression, metabolism, and aging. It’s hypothesized that if resveratrol can successfully stimulate the human sirtuin genomes, it can suppress DNA instability and repair damaged DNA, thereby reducing disease development and increasing longevity. Early research documented resveratrol’s effects on life span in yeast,10 fruit flies, nematode worms,11 and short-lived fish,12 but these findings recently have been challenged. Burnett and colleagues13 reexamined the key experiments linking sirtuin to longevity in animals and found that animals with higher levels of sirtuin lived longer than controls. But when they took precautions to differentiate the controls and test subjects only according to sirtuin levels, the longevity effect disappeared. Other studies had similar findings, leading to the conclusion that genetic factors other than sirtuin genes were responsible for the longevity. Despite this conflict, it appears resveratrol has an effect similar to that of caloric restriction, blunting the age-related decline in heart function.14 This finding will need to be replicated in humans before researchers can make any therapeutic claim, but previous studies have laid the groundwork. Resveratrol has been found to inhibit the proliferation of a variety of human cancer cells, protect against diabetes-related complications, and hinder plaque formation that leads to Alzheimer’s disease. However, much more research is needed. Following is a summarization of the current evidence on resveratrol’s effects on specific diseases and conditions. • Cardiovascular disease: As mentioned, moderate red wine consumption has long been known to reduce the risk of heart disease, in part because of the relaxing effect of alcohol. However, polyphenilic compounds, including resverstrol, have an antioxidant, anti-inflammatory, antiatherogenic effect in vitro. The compound trans-resveratrol has been shown to help block platelet aggregation in humans.15 This antiaggregating property thins the blood or makes it less sticky, thereby lowering the risk of blood clots that can cause stroke, heart attack, and other blood vessel diseases. Resveratrol, along with quercetin, appears to be beneficial for hypertension because it has a vasodilator effect on blood vessels17 by enhancing the production of nitric oxide and preventing free radical damage to blood vessels. (Quercetin is a yellow powdered crystalline compound that occurs as a glycoside in the rind and bark of numerous plants.) Some findings in animal studies suggest that high oral doses of resveratrol could decrease the risk of thrombosis and atherosclerosis16 but not all report this positive effect.18 Convincing evidence that resveratrol has cardioprotective effects in humans, particularly in the amounts consumed in a glass or two of wine, is lacking, and the early enthusiasm for this possible claim has waned. Nevertheless, the French Paradox remains. • Cancer: Carcinogenesis is a complicated multistep process. All cancers begin when mutations, changes, or damage occur in a cell’s DNA, resulting in the uncontrollable growth and spread of abnormal cells. In contrast, normal cells reproduce in an orderly, controlled fashion. Exposure to a substance that alters cellular DNA starts the process. Genetic, viral, or environmental carcinogens produce free radicals, which can damage a cell’s DNA, leading to the first stage of cancer development called initiation. Resveratrol was found to act as both an antioxidant and antimutagenic in rat models,19 thus potentially inhibiting the development of certain cancers. In these studies, resveratrol increased levels of phase 2 detoxification enzymes that attach carcinogens to other molecules that act as carriers to remove them from the body. Resveratrol appears to interfere with the promotion of cancer cells, the stage during which damaged cells grow and multiply uncontrollably, resulting in tumor development, growth, and proliferation. Resveratrol was found to inhibit the proliferation of various tumor cells in vitro, including lymphoid and myeloid cancers; melanoma; multiple myeloma; squamous cell, ovarian, and cervical carcinoma; and cancers of the breast, colon, pancreas, prostate, stomach, and thyroid.20 Even more intriguing, resveratrol is thought to help repair damaged information in cell DNA21 and encourage apoptosis of damaged cells.22 There’s much excitement about the proposed ability of resveratrol to arrest the unchecked growth of DNA-damaged cells, which crowd out healthy cells and damage surrounding tissue. • Diabetes: Resveratrol appears to protect against neuropathy caused by poorly controlled diabetes. In one study,25 resveratrol injections provided renal damage protection, as determined by significant improvement in renal function and a decrease in oxidative stress. In addition, resveratrol may be beneficial in the prevention and treatment of age-related macular degeneration, a major cause of vision loss worldwide. The potential role of resveratrol in preventing blindness is promising, but much more research is required before researchers can reach any firm conclusions or offer recommendations. Obese mice fed a high-calorie diet supplemented with resveratrol experienced an increase in insulin sensitivity, along with improvements in other markers that indicated better blood glucose control.12 Other studies have corroborated these findings and have found that resveratrol may improve fasting blood glucose levels and oral glucose tolerance.29 Recent clinical trials in humans suggest that resveratrol lowers blood sugar levels. Findings from this research, conducted by a pharmaceutical company, were discussed in review articles but haven’t been published in peer-reviewed journals. • Alzheimer’s disease: The causes of Alzheimer’s are unknown, but it is known that information transfer at neuronal synapses in the brain begins to fail. This likely develops because of multiple factors rather than a single one. In Alzheimer’s disease, the brain is characterized by a buildup of plaques and twisted tangles of beta amyloid proteins that block neural pathways and disconnect the memory and brain circuit pathways.30 In one study,29 resveratrol was shown to significantly reduce plaque formation in animal brains. It appears to degrade some beta amyloid proteins and may even block the production of new types of beta amyloids,31 thus reducing the amyloid plaque buildup associated with aging. The most abundant natural sources of resveratrol are the grape varieties common, muscadine, and catawba. Raspberries, mulberries, blueberries, bilberries, cranberries, and peanuts contain the compound as do some inedible plants such as eucalyptus, spruce, lily, Scots pine, eastern white pine, and Japanese knotweed. Environmental factors influence the amount of resveratrol in grapes. Resveratrol is synthesized in response to invading fungi and since fungal infections are more common in cooler climates, grapes grown in these regions have higher concentrations of the phytochemical. Grapes grown in cold, mold-friendly climates (eg, France’s Bordeaux region and the Willamette Valley of Oregon) produce grapes with higher resveratrol content than those grown in dry, temperate climates. Unhealthy or stressed grapes have the highest concentration of resveratrol. Resveratrol concentrations also are related to the length of time grapes remain in their skins during the fermentation process. Red wine is fermented with the skins, allowing the liquid to absorb the resveratrol; the skins are removed during white wine production, reducing the amount of resveratrol that’s extracted.43 Scant amounts of resveratrol are found in grape meat. Information about the resveratrol content of food is scarce and must be viewed in the context that it may vary within the same food group. Oregon State University’s Linus Pauling Institute43 provides a chart listing the resveratrol content of certain foods (see tables below). The fruits mentioned in the table are available, but they aren’t as easy to store in their readily available form as red wine. Still, obtaining the same doses used in clinical trials through food or beverage sources (as noted in the table) is impractical, creating a market for resveratrol supplements. Dietary supplements (pills or liquids) are generally labeled as containing 20 to 500 mg of resveratrol per tablet or capsule, yet the composition of these products is unknown. Sometimes resveratrol is combined with vitamins and/or other ingredients. Most supplements sold in the United States contain resveratrol extracted from the Japanese and Chinese knotweed plant, Polygonum cuspidatum, while others are made from wine or red grape extracts. Japanese knotweed also contains emodin, known to stimulate bowel activity so diarrhea is a possible side effect. Similar to grapes, the resveratrol content in the roots of the Japanese and Chinese knotweed varies from plant to plant depending on environmental factors. As discussed, only small amounts of resveratrol are found in a normal diet. In the animal and human studies conducted thus far, the dose of resveratrol used has been much larger than any amount someone can obtain through diet alone. Resveratrol supplements may contain a dosage equivalent to hundreds of bottles of wine, but typically they contain a much smaller dose than those used in research. Most supplements contain 20 to 500 mg of resveratrol. To get a dose equivalent to that used in some animal studies, a person would have to consume 2,000 mg or more of resveratrol per day. In light of this, drug companies are working on synthetic or chemical versions of resveratrol. In these forms, however, many of the beneficial substances, such as polyphenols found in food sources, will be absent. An important fact to keep in mind is that the FDA doesn’t regulate resveratrol supplements so there’s no guarantee that the dosage listed on the label is the actual amount present in the capsule. Often supplements will vary in content and purity of the intended compound. Consumer Labs, an independent testing and quality control organization, analyzed nine different resveratrol supplements and reported that two had far less resveratrol than what the label stated. One supplement claimed to contain 400 mg of a “red wine grape complex” but contained only 2.2 mg of resveratrol per caplet. The recommended dosages varied from 50 mg to 1,020 mg per day. Furthermore, the cost of supplements varies widely, and each manufacturer arbitrarily sets the suggested dosage, often without basing it on human clinical trial evidence. The promotion of resveratrol far exceeds its base of clinical research. Few human studies evaluating the potential benefits or long-term risks of resveratrol supplements have been reported. There appear to be more questions than answers regarding the effectiveness of the compound in humans.8 Until more high-quality research is available, health professionals should refrain from recommending resveratrol supplements for antiaging or disease prevention. It’s likely that companies will develop a pharmacologic form of resveratrol and with more research, one day we may be able to offer conclusive, evidence-based dietary recommendations. Until then, we should continue to recommend clients eat a plant-based diet that’s abundant in antioxidant-rich foods such as red grapes, berries, and peanuts to help prevent chronic disease. Moderate red wine consumption also won’t hurt. — Karen Lilyquist, PhD, RN, RD, LD, has 22 years of nutrition practice experience. Since 2006, she’s taught nutrition classes for the University of Phoenix, moderated teleconferences for the National Institute for Health Education & Training, and authored continuing education courses for Nutrition Dimension. 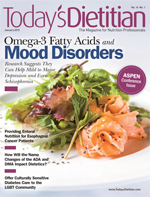 Dawn L. Privett, RD, LD, CLT, and Carol Ann Brannon, MS, RD, LD, contributed to this article. 1. Evaluate the characteristics and proposed mechanism of action of resveratrol. 2. Examine the food sources of resveratrol. 3. Assess the potential benefits of resveratrol related to diabetes, cardiovascular disease, and Alzheimer’s disease. 4. Distinguish the proposed antiaging properties of resveratrol. 5. Analyze at least one problem with the current delivery system for resveratrol. 1. Resveratrol is considered which of the following? 2. Resveratrol is naturally found in which foods? 5. Resveratrol appears to be protective against cardiovascular disease by doing which of the following regarding LDL cholesterol? c. programmed cell death and containment of damaged cells. 7. Resveratrol intake may lessen which diabetes symptom? 8. Resveratrol intake offers neuroprotection for which condition? 10. In light of the research surrounding resveratrol, health professionals should do which of the following? a. Recommend resveratrol supplements for those who express interest. b. Refrain from recommending resveratrol supplements for antiaging and disease prevention. c. Discuss the health benefits of resveratrol. d. Tell clients to avoid high-oxidant foods. 1. Ferrières J. The French paradox: Lessons for other countries. Heart. 2004;90(1):107-111. 2. Bellisle F. Nutrition and health in France: Dissecting a paradox. J Am Diet Assoc. 2005;105(12):1870-1873. 3. Irz X, Shankar B, Srinivasan CS. Dietary recommendations in the report of a joint WHO/FAO expert consultation on diet, nutrition and the prevention of chronic diseases (WHO Technical Report Series 916, 2003): Potential impact on consumption, production and trade of selected food products. http://www.hubrural.org/pdf/fao_who_report_diet.pdf. November 2003. Accessed September 28, 2011. 4. Dohadwala MM, Vita JA. Grapes and cardiovascular disease. J Nutr. 2009;139(9):1788S-1793S. 5. Nicoletti A, Mostile G, Cappellani R, et al. Wine drinking and essential tremor: A possible protective role. Mov Disord. 2011;26(7):1310-1315. 6. Anekonda TS. Resveratrol—a boon for treating Alzheimer’s disease? Brain Res Rev. 2006;52(2):316-326. 7. Brown L, Kroon PA, Das DK, et al. The biological responses to resveratrol and other polyphenols from alcoholic beverages. Alcohol Clin Exp Res. 2009;33(9):1513-1523. 8. Smoliga JM, Baur JA, Hausenblas HA. Resveratrol and health—a comprehensive review of human clinical trials. Mol Nutr Food Res. 2011;55(8);1129-1141. 9. Susser AJ. The Good Book to Great Health. Lake Dallas: Momentum Media; 2005. 10. Howitz KT, Bitterman KJ, Cohen HY, et al. Small molecule activators of sirtuins extend Saccharomyces cerevisiae lifespan. Nature. 2003;425(6954):191-196. 11. Bass TM, Weinkove D, Houthoofd K, Gems D, Partridge L. Effects of resveratrol on lifespan in Drosophila melanogaster and Caenorhabditis elegans. Mech Ageing Dev. 2007;128(10):546-552. 12. Baur JA, Pearson KJ, Price NL, et al. Resveratrol improves health and survival of mice on a high-calorie diet. Nature. 2006;444:337-342. 13. Burnett C, Valentini S, Cabreiro F., et al. Absence of effects of Sir2 overexpression on lifespan in C. elegans and Drosophila. Nature. 2011;477(7365):482-485. 14. Barger JL, Kayo T, Vann JM, et al. A low dose of dietary resveratrol partially mimics caloric restriction and retards aging parameters in mice. PLoS One. 2008;3(6):e2264. 15. Stef G, Csiszar A, Lerea K, Ungvari Z, Veress G. Resveratrol inhibits aggregation of platelets from high-risk cardiac patients with aspirin resistance. J Cardiovasc Pharmacol. 2006;48(2):1-5. 16. Wang Z, Zou J, Huang Y, Cao K, Xu Y, Wu JM. Effect of resveratrol on platelet aggregation in vivo and in vitro. Chin Med J (Engl). 2002;115(3):378-380. 17. Chen CK, Pace-Asciak CR. Vasorelaxing activity of resveratrol and quercetin in isolated rat aorta. Gen Pharmacol. 1996;27(2):363-366. 18. Wilson T, Knight TJ, Beitz DC, Lewis DS, Engen RL. Resveratrol promotes atherosclerosis in hypercholesterolemic rabbits. Life Sci. 1996;59(1):PL15-21. 19. Jang M, Cai L, Udeani GO, et al. Cancer chemopreventive activity of resveratrol, a natural product derived from grapes. Science. 1997;275(5297):218-220. 20. Aggarwal BB, Bhardwaj A, Aggarwal RS, Seeram NP, Shishodia S, Takada Y. Role of resveratrol in prevention and therapy of cancer: preclinical and clinical studies. Anticancer Res. 2004;24(5A):2783-2840. 21. Gatz SA, Keimling M, Baumann C, et al. Resveratrol modulates DNA double-strand break repair pathways in an ATM/ATR-p53- and -Nbs1-dependent manner. Carcinogenesis. 2008;29(3):519-527. 22. Bishayee A. Cancer prevention and treatment with resveratrol: from rodent studies to clinical trials. Cancer Prev Res. 2009;2:409-418. 23. Niles RM, Cook CP, Meadows GG, Fu YM, McLaughlin JL, Rankin GO. Resveratrol is rapidly metabolized in athymic (nu/nu) mice and does not inhibit human melanoma xenograft tumor growth. J Nutr. 2006;136(10):2542–2546. 24. Gruber J, Tang SY, Halliwell B. Evidence for a trade-off between survival and fitness caused by resveratrol treatment of Caenorhabditis elegans. Ann N Y Acad Sci. 2007;1100:530-542. 25. Sharma S, Anjaneyula M, Kulkarni SK, Chopra K. Resveratrol, a polyphenolic phytoalexin, attenuates diabetic nephropathy in rats. Pharmacology. 2006;76(2):69-75. 26. Kumar A, Kaundal RK, Iyer S, Sharma SS. Effects of resveratrol on nerve functions, oxidative stress and DNA fragmentation in experimental diabetic neuropathy. Life Sci. 2007; 80(13):1236-1244. 27. Sharma S, Kulkarni SK, Chopra K. Effect of resveratrol, a polyphenolic phytoalexin, on thermal hyperalgesia in a mouse model of diabetic neuropathic pain. Fundam Clin Pharmacol. 2007;21(1): 89-94. 28. King RE, Kent KD, Bomser JA. Resveratrol reduces oxidation and proliferation of human retinal pigment epithelial cells via extracellular signal-regulated kinase inhibition. Chem Biol Interact. 2005;151(2):143-149. 29. Lagouge M, Argmann C, Gerhart-Hines Z, et al. Resveratrol improves mitochondrial function and protects against metabolic disease by activating SIRT1 and PGC-1alpha. Cell. 2006;127(6):1109-1122. 30. Alzheimer’s Association. 2011 Alzheimer’s disease facts and figures. http://www.alz.org/downloads/Facts_Figures_2011.pdf. Accessed September 28, 2011. 31. Marambaud P, Zhao H, Davies P. Resveratrol promotes clearance of Alzheimer’s disease amyloid beta peptides. J Biol Chem. 2005;280(45):37377-37382. 32. Draczynska-Lusiak B, Doung A, Sun AY. Oxidized lipoproteins may play a role in neuronal cell death in Alzheimer disease. Mol Chem Neuropathol. 1998;33(2):139-148. 33. Benitez T. Grape seeds may combat Alzheimer’s. Wine Spectator. http://www.winespectator.com/webfeature/show/id/Grape-Seeds-May-Combat-Alzheimers_4282. August 12, 2008. Accessed September 28, 2011. 34. Luo L, Huang YM. [Effect of resveratrol on the cognitive ability of Alzheimer’s mice.] Zhong Nan Da Xue Xue Bao Yi Xue Ban. 2006;31(4):566-569. 35. Bowers JL, Tyulmenkov VV, Jernigan SC, Klinge CM. Reservatrol acts as a mixed agonist/antagonist for estrogen receptors alpha and beta. Endocrinology. 2000;141(10):3657-3667. 36. Palamara AT, Nencioni L, Aquilano K, et al. Inhibition of influenza A virus replication by resveratrol. J Infect Dis. 2005;191(10):1719-1729. 37. Docherty JJ, Sweet TJ, Bailey E, Faith SA, Booth T. Resveratrol inhibition of varicella-zoster virus replication in vitro. Antiviral Res. 2006;72(3):171-177. 38. Fontecave M, Lepiovre M, Elleingand E, Gerez C, Guittet O. Resveratrol, a remarkable inhibitor of ribonucleotide reductase. FEBS Lett. 1998;421(3):277-279. 39. Faith SA, Sweet TJ, Bailey E, Booth T, Docherty JJ. Resveratrol suppresses nuclear factor-kappa B in herpes simplex virus infected cells. Antiviral Res. 2006;72(3):242-251. 40. Singh NP, Hegde VL, Hofseth LJ, Nagarkatti M, Nagarkatti P. Resveratrol (trans-3,5,4’-trihydroxystilbene) ameliorates experimental allergic encephalomyelitis, primarily via induction of apoptosis in T cells involving activation of aryl hydrocarbon receptor and estrogen receptor. Mol Pharmacol. 2007;72(6):1508-1521. 41. Okawara M, Katsuki H, Kurimoto E, Shibata H, Kume T, Akaike A. Resveratrol protects dopaminergic neurons in midbrain slice culture from multiple insults. Biochem Pharmacol. 2007;73(4):550-560. 43. Linus Pauling Institute. Resveratrol. http://lpi.oregonstate.edu/infocenter/phytochemicals/resveratrol. Published March 2005. Updated May 2008. Accessed October 8, 2011.